Fermented with Maine cherries and Brettanomyces, Nancy was aged for almost one whole year in stainless steel. Pours golden orange/light copper. Got tons of carbonation coming off the bottom of the glass. There was over a finger of white, fizzy head, but it disappeared almost immediately like highly-carbonated soda. A nice bouquet of sweet, tart cherries, saison-like funk, breadiness, Belgian yeast, and even a hint of vanilla. One sip in and you are in for a mouth-puckering ride of delicious sourness. The cherries are pretty much perfect as they don't take over or make the beer taste like cough syrup. It's just the right amount of tartness. It's funky like a saison and even has some black pepper notes. It's also quite citrusy as I get grapefruit juice and mango too. Again, this is a sipper due to it's potent sour taste. There's lots of carbonation bubbles dancing on my tongue and it has a solid body for a lighter style. The tartness lingers nicely and the cherry isn't sticking to my tongue. With big, genuine cherry flavor and spot-on tartness, this could be classified as a Flanders Red and compete with the best in that style. 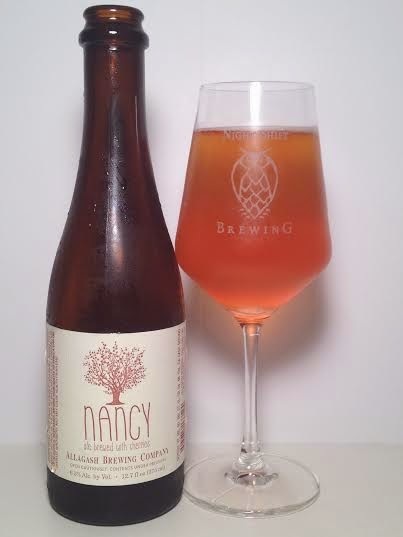 Nancy has a splendid balance of fruity flavors, funk, bread, and yeast. This would have been ideal for the warmer weather a few months ago, but I'm not complaining about having this bottle to myself on a cold night like this.